by Kennon L. Callahan. Jossey-Bass, 2010. Now in its second edition, this book offers practical guidelines and tools to help congregations claim and expand upon their strengths and become stronger and healthier. Kennon Callahan is a researcher, professor, pastor, and sought-after consultant whose time-tested approach has been used successfully by thousands of congregations of all sizes. In Part One, the author reviews five basic qualities of strong, healthy congregations: grace, strength, compassion, excellent sprinters, and act swiftly. 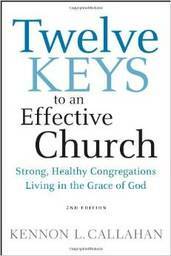 In Part Two, he explores in-depth the twelve keys to unlocking potential for effective ministry - among them mission, visitation, worship, relationships, leadership, decision making, programming, buildings and facilities, and giving. This second edition now incorporates a previously-separate Planning Workbook, additional resources for implementing the Twelve Keys, and new material and insights on mission, sacrament, and grace. Companion resources include a Leaders’ Guide and a Bible Study, both published in 2010. The Twelve Keys program balances practical planning with theological understanding to help churches function more effectively as they seek to grow and to better serve their members.